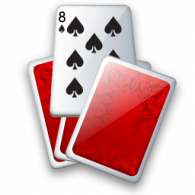 CHECK OUT MY LATEST "GAMBLER" TRAFFIC OFFER-I GUARANTEE YOU MAKE SALES EVERY 250 CLICKS I SEND - LETS CHAT! I understand what it takes to deliver GREAT traffic for your needs. So, What Makes My Traffic More Responsive And More Prone To Buying? Unlike 97% of traffic sellers out there, pushing out burned out traffic, that's not targeted and likely sick of receiving emails from corney marketers, I nurture my list and treat them like gold. 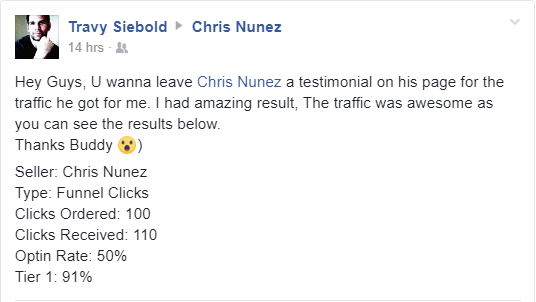 I push my traffic through a rigorous process that only spits out the hottest most pre-qualified leads ready to see your offer. 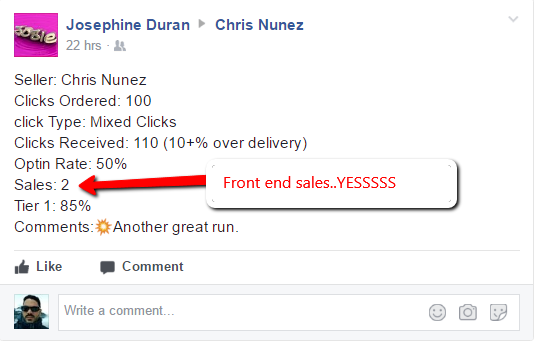 I'm able to flood your offer with fast traffic, meaning you wont be waiting weeks for delivery of clicks to be complete. I know what works, and what doesn't when it comes to offers. 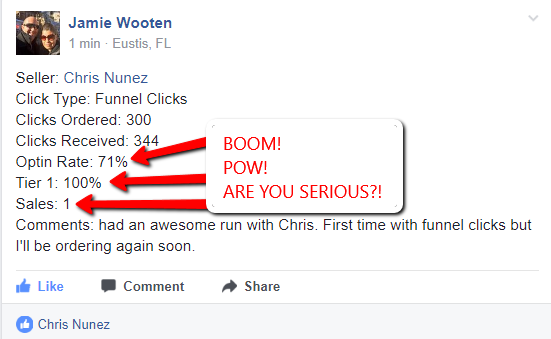 I can review your funnel and give you tips to get the highest conversions. IMPORTANT INFORMATION: After you have chosen your package and paid, you will be redirected to a page with instructions on the next steps I need to do before I start your order. 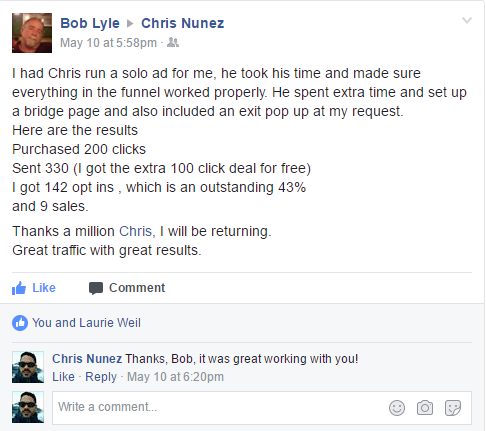 What is the difference between Funnel Clicks and Solo Clicks? In the meantime if you need anything use the button below and lets chat! This could be the start of a very profitable relationship and I can't wait to link up! 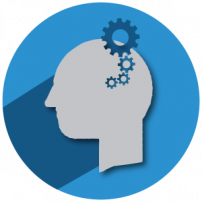 Need a Tailored and Custom Traffic Package or a Different Niche? Want to order in bulk? Want a special on a monthly traffic subscription? Looking for custom traffic from just USA? Want traffic in the Health and Fitness or Dating niches? I can supply exactly what you need, just use the button below and lets talk. WARNING - TIME SENSITIVE OFFER! What If I Could GUARANTEE you a SALE for Every 250 clicks I Send From My Special 100% T1 "Love To Buy Stuff" List? Well Thats Exactly What I Wanna Do...You Wanna Gamble? 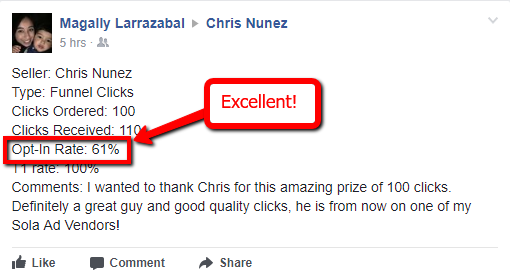 Now, If You DON'T GET A SALE For Every 250 Clicks I Send I Will Double Your Order For Free and Send You More Clicks On The House! 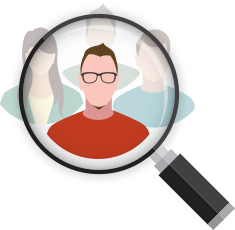 I conduct full testing of your funnel to make sure Double Opt-In is turned off and your follow up emails aren't hitting the Spam folder. AND...I'll stay subscribed to your list and read your follow messages to make sure they look good and are doing the job they are supposed to...to SELL! 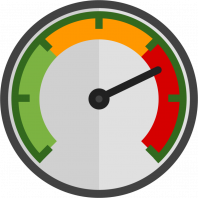 Need A High Converting Landing Page To Send My Traffic To? Options are a ONE TIME cost. I save ALL of your pages which can be easily re-used or modified for your next order! I highly recommend Builderall for your Landing Page creation needs. 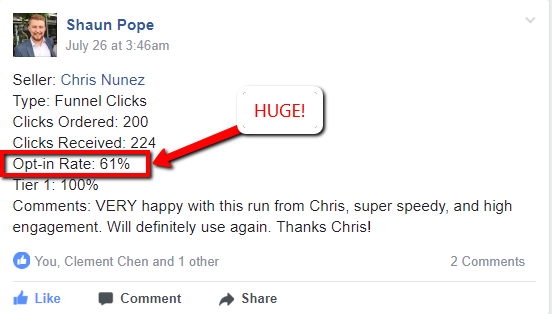 Tom - "I Will Definitely Be Using Chris's Traffic Again!" Femi - "His Traffic Rocks"
Sherri- "The Numbers Don't Lie. What An Awesome Run!!" Travy- "I Had Amazing Results!" 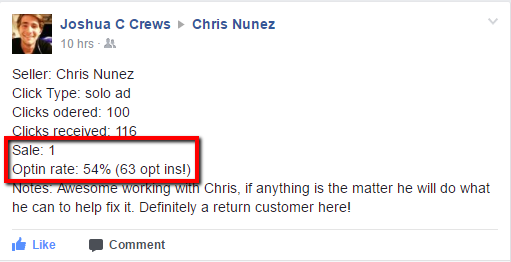 David- "Third Order With Chris...Will Use Again!" Jamie- "I Was In SHOCK With The Opt In On This!" Siboe- "His Traffic is Diamond!" Femi- "Will DEFINITELY Buy Again!" 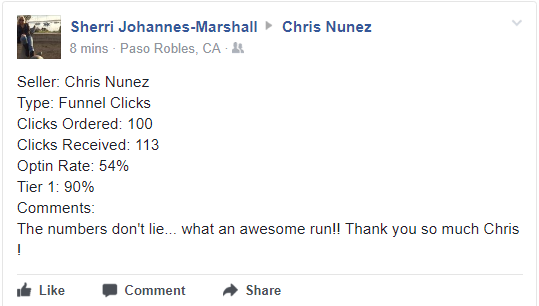 Sally- "I Recommend 100% He Is The Best"
Joshua- "Awesome Working With Chris!" 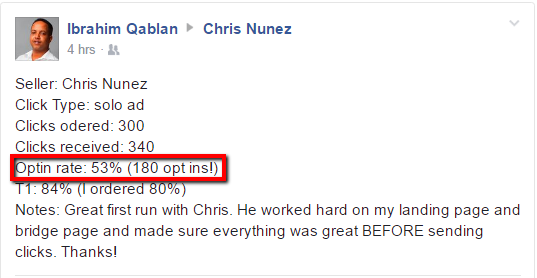 Ibrahim- "He Made Sure Everything Was Great"
Darren- "105 Opt-Ins From 200 Clicks"
David- "I'm VERY HAPPY With The Results"
Bob- "Thanks A Million - Great Traffic Great Results!" 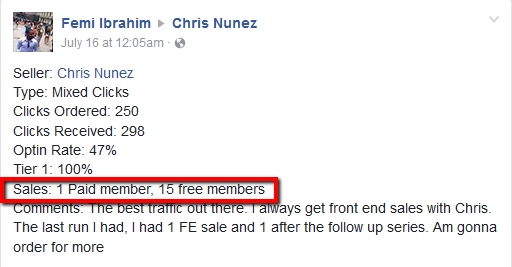 Jon- "96 Opt-Ins And 8 Free Members"
Vlasta- "7 Free Members, 1 Upgrade To PRO!" 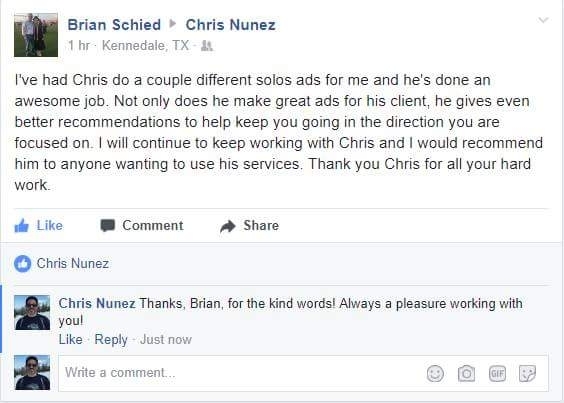 Brian- "I Would Recommend Him To Anyone!" 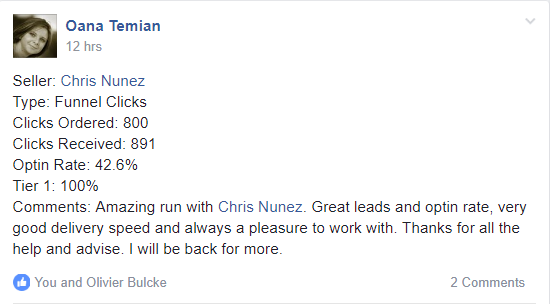 Dave- "Your Leads Are FANTASTIC!!" 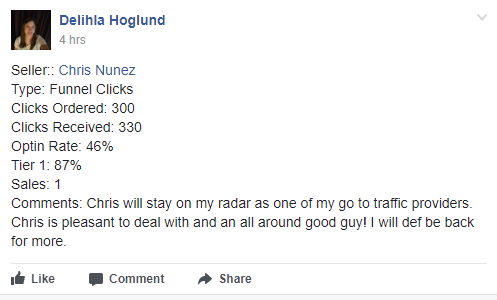 Curtis- "I'm Gonna Buy Every Bit Of Traffic He Can Send!" 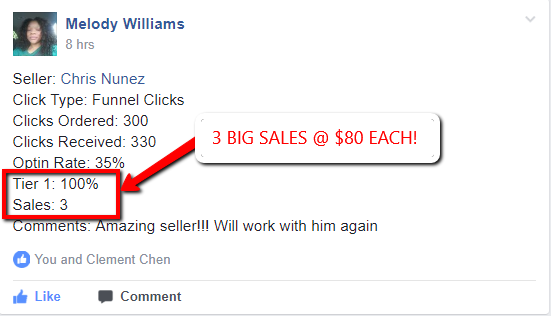 Lee- "5 SALES From Just 100 Clicks!" 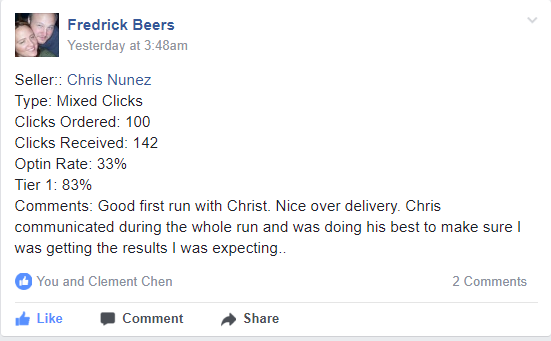 Ricky- "16 NEW SIGN-UPS - Highly Recommended"
David- "Chris Is My Most Trusted Number 1 Guy"
Ken- "Awesome Leads And CPA SALES!" 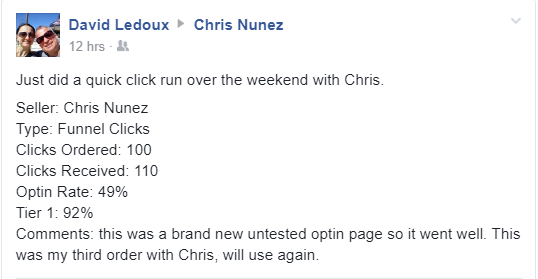 James- "61.2% Optin Rate, Thank You Chris!" Delihla- "I Will Def Be Back For More!" 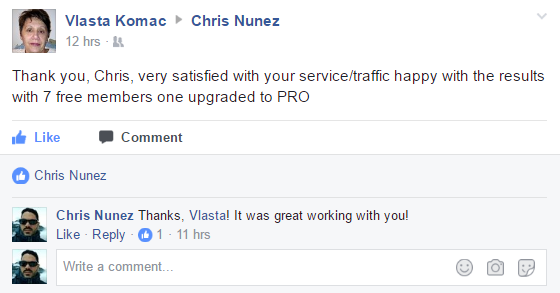 Magally- "A Great Guy And Good Quality Clicks"
Femi- "The BEST Traffic Out There!" 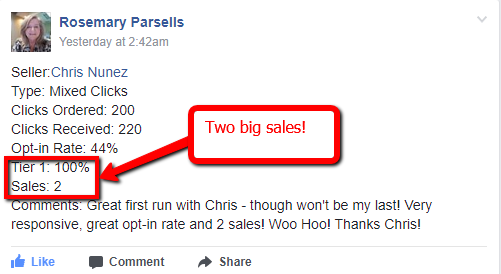 Rosemary- "Great Optin Rate And 2 SALES!" Oana- "Great Leads and Optin Rate"
Shaun - "Super Speedy and High Engagement!!" Jamie - "I'll Be Ordering Again Soon!!" IMPORTANT INFORMATION: After you have chosen your package and paid, you will be redirected to a page me with instructions on the next steps I need to do before I start your order. I look forward to connecting with you and providing you with all the clicks you will ever need for your business. Please get in touch if you need anything before making a decision. I'm here to help you succeed. Disclaimer: *I CANNOT determine the results you will receive with your solo ad. 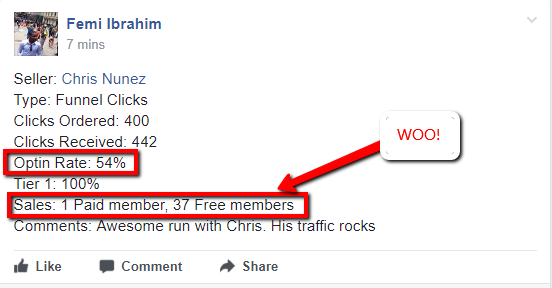 However, I could guarantee that your offer will be sent to my high quality & responsive list and you'll get the UNIQUE clicks that you paid for. 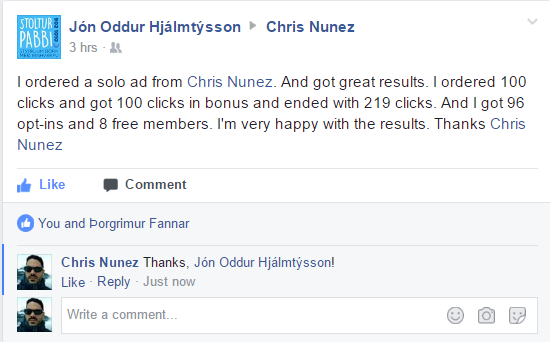 There are NO REFUNDS for Solo Ads. 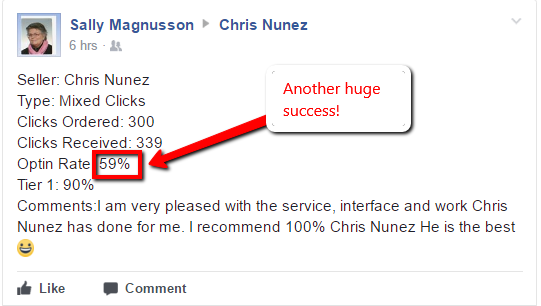 If you are not 100% certain you want our services please do not purchase.